Join Save Our Shores! Florida, Sierra Club, Surfrider Foundation and others as we lock HANDS ACROSS THE SAND in protest of new offshore drilling on Saturday, June 26, 2010 starting at 11:00am EST. Hands Across the Sand is a movement made of people of all walks of life and crosses political affiliations. This movement is not about partisan politics; it is about protection of our coastal economies, oceans, marine wildlife, fishing industry and coastal military missions. Let us share our knowledge, energies and passion for protecting all of the above from the devastating effects of oil drilling. To find the lead organizer for your state event, click here. To Donate to Save Our Shores! Florida's efforts to stop offshore drilling, click here. In Florida on Saturday, February 13, 2010, a statewide gathering against oil drilling occurred. Thousands of Floridians representing 60 towns and cities and over 90 beaches joined hands to protest the efforts by the Florida Legislator and the US Congress to lift the ban on oil drilling in the near and off shores of Florida. 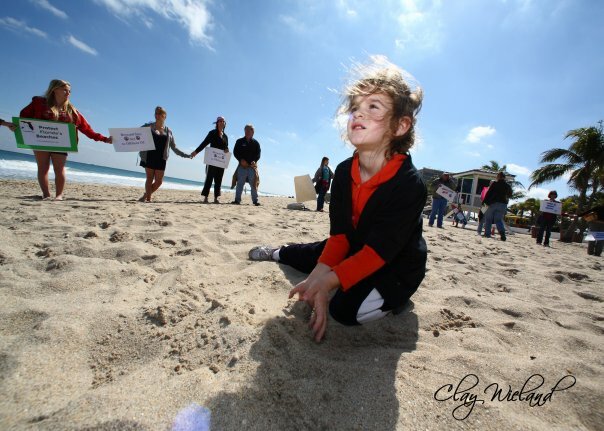 Florida’s Hands Across The Sand event was the largest gathering in the history of Florida united against oil drilling. Thousands joined hands from Jacksonville to Miami Beach and Key West to Pensacola Beach, each against oil drilling in Florida’s waters. Congratz from Sarasota! We'll be the Hands Across the Sand on Siesta Key Public Beach that day! I too will be at a Hands Across the Sand event somewhere near Tampa... haven't quite decided as to which one, but I'll be bringing everyone I can get to tag along..
Save the Gulf from Ecocide!! This is going to be an awesome event! About a year ago, a friend of mine gave me a book by Michael Diamond who is a well respected legal scholar, a realist and an idealist at heart. The book sat in a pile of other books that I had been meaning to read until two weeks ago. I looked down and saw Diamond’s book on top of the pile. The book title ‘If You Can Keep It: A Constitutional Roadmap to Environmental Security’ screamed at me. Elated, at the hope suggested in the title, I picked up the book. Like a great lover, a book can be a source of comfort and inspiration. Diamond’s book delivered. It is the real deal. Diamond’s plainspoken argument is that our government has a Constitutional obligation to protect the people from environmental harms. It is time for both sides of the spectrum to rediscover the genius in Michael Diamond’s work. I urge you all to read this book and talk with your State Legislators. Please demand that they begin calling on the Federal Government to protect us and the environment before it is too late. Wake now, discover!